INCREDIBLE price (UNDER tax assessment) on 10+ acres, for quick sale. Custom home, JF schools, refinished hardwoods, relaxing front porch perfect for rocking chairs, covered back porch ideal for grilling/dining, and outdoor fun. Main level master, his/hers closets with newly tiled shower in master bath. 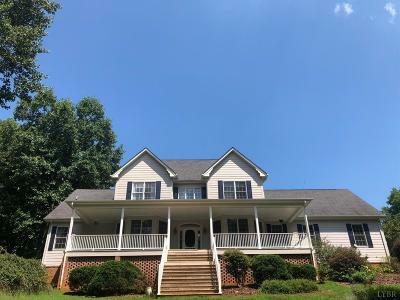 You'll love the private setting, and what a fabulous floor plan for entertaining with formals, and great room featuring soaring ceiling with beautiful windows, floor-to-ceiling brick fireplace. Nice kitchen with granite, back splash, plenty of counter space and cabinets. Adjacent laundry room could also be home office, craft room, pantry. Garage just a few steps away for ease with bringing in groceries. Second level is spacious with three bedrooms, one large enough for multiple beds, full bath, and overlooks the great room. With wild life, lush landscaping, and complete privacy, the setting is just ideal, yet a few minutes to Forest Kroger, schools, restaurants, and shopping. WOW!